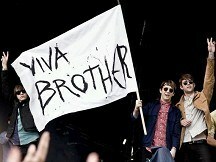 The rock group adopted the name Viva Brother after a legal challenge from an Australian act, based in the US. The Britpop band from Slough were signed to label Geffen Records last October but their growing profile in the US brought them to the attention of the other group. They were handed the writ as they performed in San Francisco in April. In years gone by, acts such as the Charlatans and the Chameleons have drawn a distinction by adding "UK" to their name to avoid confusion. The band tried this but it was thought to be unworkable because of the digital age. The band, who release debut album Famous First Words in August, are performing a number of festivals including Hop Farm and Reading and Leeds this summer. Lead singer Lee Newell said of the name change: "A long time ago in a galaxy far, far away three men decided one day that it would be a good idea to start a band called Brother. "Many, many years later four frighteningly handsome devils in the desolate, post-apocalyptic wasteland of Slough decided to do the same thing. But something called 'litigation' got in the way. "However with this out of the way we do finally feel free. Brother is dead. Long live Viva Brother."